Monastiraki part 2. 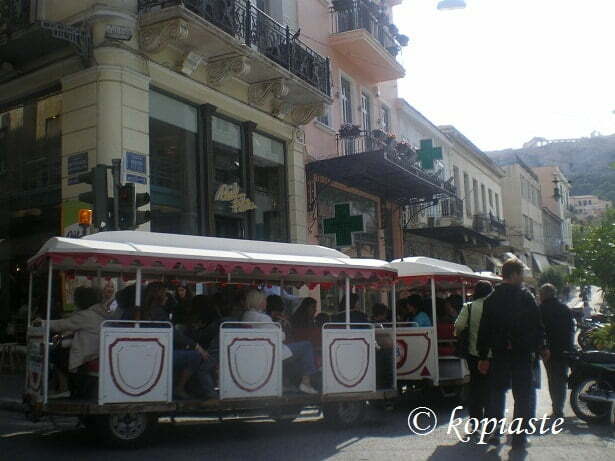 We will expore the Roman Forum, Aerides and walk through the picturesque narrow roads of Anafiotika, in upper Plaka. In my previous post we went to Monastiraki and from there we walked to the Ancient Agora, where we visited the Stoa of Attalus, the Museum and the Temple of Hephaestus. Then we strolled in the Youssourum (flea market). Today we are going to visit Anafiotika, which is a scenic tiny neighborhood of Athens, part of the old historical neighborhood called Plaka. Starting again from Monastiraki, after passing the Mosque and Hadrian’s Library, this time we shall turn left. The other side of Hadrian’s Library is situated on Aeolou Street. On the corner of Pelopidas and Panos Stree we will find another mosque, called Fethiye (which means Mosque of the Conquest). This is another 15th-century mosque, constructed during the Ottoman occopation. It was built in 1456/1458, on the ruins of a mddle Byzantine basilica. From 1834, after the Greek independence, and until the early 20th century, it was used as a military bakery. Since then it was used mostly as a storage place for various finds from the excavations in the Agora and other antiquities. Right next to the mosque is the entrance of the Roman Forum which was built next to the Ancient Athenian Agora, during the second century B.C. after the Romans conquerred the Greeks. It combined the market place as well as a meeting place of the Romans, as the Romans wanted their own Forum. Under the Northern side of the Acropolis and just opposite the Gate of Athena Archegetis is one of the most prominent remains in the site of the Roman Agora, which is the Clock of Kyrristos, also known as the Tower of the Winds. It was built by the Greek astronomer Andronicus of Cyrrhus during the era of Sulla around 50 BC. The tower, also called horologion (timepiece), is an octagonal structure, 3.20 metres wide and 12 metres high, made of Pentelic marble. The structure features a combination of sundials, a water clock, and a wind vane. Walking around the area of the Roman Agora there are many Museums you can visit, or you can just walk through the picturesque, narrow streets with beautiful old houses. Personally, this reminded me of the beautiful old city of Nafplion. From there we headed toward the direction of Acropolis, for the neighbourhood of upper Plaka, called Anafiotika. Anafiotika lies in the northerneastern side of the hill of The Acropolis. The first houses were built in the era of King Othon (Otto), when workers and craftsmen, from the Cycladic island of Anafi came to Athens during the 19th century, in order to work as constructor workers for the construction of various buildings in Athens, including King Otto’s Palace. The new neighbourhoold was built following the architectural style of the Cycladic islands. The workers, including carpenters or even stone and marble workers, also restored two of the churches of the 17th century, that of St. Symeon and Agios Georgios ton Vrahon (St. George of the rocks). After the events of 1922, immigrants from Asia Minor also settled there, altering the population that was up to that time only from Cycladic islands. In 1950, part of this neighborhood was destroyed for archeological researches and in 1970 the Ministry of Culture started buying the houses. Nowadays there are only 45 old houses which have been restored and are protected and maintained as historical buildings. One of the largest mansions of the 19th century, housed the first University of Athens, constructed by Architect Stamatios Kleanthis. It is situated on Tholos Street and today it operates as a museum. On Theorias Street, is the church of Metamorphosis tou Sotiros, built during the 14th century, with its characteristic high dome. Aghia (saint) Paraskevi, also lived an ascetic life there. Near the church, Odysseas Androutsos, a hero of the Greek Revolution, was found killed under the Acropolis on the 5th June, 1825. Like most of the churches which were built during the Byzantine era, material from ancient temples were used to build these churches, including this one. Heading downwards for our return back, we passed from tavernas, restaurants and caffeterias, where one can eat or rest, enjoying the view, drinking a cup of coffee. That was exactly what we needed after walking uphill for some time. After a short rest, we returned back to Aeolou Street. This street was named after Aeolos, who was the ruler of the Winds, according to Greek Mythology. The street was originally called Aeolic Street because it ended at the site where the Tower of the Winds is situated. We returned back to Monastiraki Street and just opposite we headed towards Athinas Street, an interesting street to explore. The church of Saint Kyriaki (28 Athinas Street) was built during the Ottoman occupation. This church was situated inside a cemetary, according to Greek tradition, which ended somewhere near Pantanassa Church, at Monastiraki. At the time the cemetary was, of course, outside the boundaries of the city. The street is particularly interesting for foodies as there one can buy all sorts of household traditional objects, as well as all sorts or traditional products. At the junction with Evripidou street and other roads one can also find spices from all over the world..
On Athinas Street you can also visit Varvakeios, the Central market of Athens, which you may read about in a prvious post. Monastiraki is one of my favorite neighborhoods in Athens. Lovely place! Beautiful pictures of the area! I’m in Athens now and will have to wander over to the neighborhood. Thanks for sharing!